The Union Chapel celebrated its famous "Father Willis' Organ in October 2017 with the 2nd Organ Reframed Festival, which was created and curated by its festival director Claire Singer. The organ was build by Henry Willis and finished the same year that the new Union Chapel was opened. The architect was James Cubitt. Day 1:Organ Reframed: Six New Works Composed by Mira Calix, Emily Hall, Tim Hecker, Gordon Monahan, Phill Niblock and Kaitlyn Aurelia Smith + Performed by James McVinnie, London Contemporary Orchestra, special guest Gordon Monahan Day 2: Organ Reframed: Low - In their 25 year career to date, Low have garnered an array of praise from critics and artists alike. Their exploration of minimalist soundscapes and harmonies have inspired covers from the likes of Robert Plant and Mavis Staples. Claire M Singer supported Low. Day 3: Organ Reframed Cinema: The Cabinet of Dr. Caligari with new score by Adam Bryanbaum Wiltzie (Stars of the Lid) Performed by James McVinnie + LCO Soloists + LCO choir Sound installation by Dawn Scarfe Throughout the festival artist Dawn Scarfe’s site-specific installation will be in place exploring sensitivity and resonance - Accessible at all Organ Reframed events. 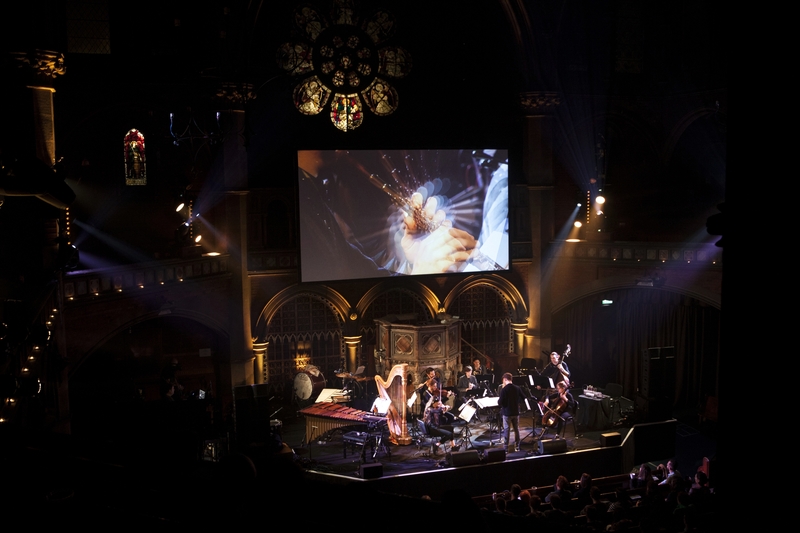 The third annual Organ Reframed, returns to Union Chapel with a truly experimental approach to this culturally important instrument. The only festival of its kind in the UK Organ Reframed focuses on commissioning innovative new music and introducing new artists and audiences to how versatile this instrument is. The two-day international festival will invigorate this remarkable instrument and embed it in the music of the 21st century. Running from the 12th to 13th October the 2018 festival will see nine world premieres of cutting edge new works from composers at the forefront of contemporary music. With a mixture of film, music and sound art, the festival will conclude with a landmark performance of a new work by Éliane Radigue – widely regarded as one of our greatest living composers and a pioneer of experimental music. Saturday evening’s programme opens with a new piece from one of Hollywood’s most sought after film composers, Hildur Guðnadóttir, currently making headlines as the newly signed composer for the upcoming film Joker with Joaquin Phoenix, making her the first woman to compose a score for a live-action DC Comics film. Previous scores include Sicario: Day of the Soldado and Mary Magdalene. Hildur has also released four critically acclaimed solo albums on touch and written widely for theatre and dance. Hildur will be performing her new work live with James McVinnie and the London Contemporary Orchestra Soloists. The second half of Saturday evening is nothing short of a historic event for contemporary music. Éliane Radigue, a pioneer of musical evolution since the 1960’s, has composed her first work for organ, which will be performed by Frédéric Blondy. After the performance there will be a screening of a short documentary of Éliane working on the commission which will afford attendees a rare glimpse into her artistic process. A staple of the Union Chapel calendar, Daylight Music curated by Arctic Circle combines an eclectic programme of music with a magical atmosphere every Saturday from noon. A special edition for Organ Reframed will feature multi-instrumentalist Terry Edwards (PJ Harvey, Spiritualised, Nick Cave) joined by Seamus Beaghen (Iggy Pop, Death in Vegas, Morrissey), plus performances from singer-songwriter Douglas Dare and electropop keyboard player, singer and producer Deerful. Ahead of both Friday and Saturday evening concerts, festival partners Spitfire Audio will present panel discussions on Composer Insights with Emmy award winner composer Michael Price (Sherlock) and more to be announced. Throughout the weekend, attendees to any of the Organ Reframed events will also get to enjoy a special sound installation by Kathy Hinde. Exhale, is inspired by the impressive bellows that provide pressured air for the Union Chapel organ and uses mechanical bellow systems to resonate acoustic sound making devices. Organ Reframed is curated by composer and Music Director of the organ at Union Chapel, Claire M Singer, whose recent albums Solas and Fairge, released on Touch, received wide acclaim. Working closely with the highly sought after London Contemporary Orchestra she has created a unique festival at Union Chapel, Islington’s magnificent cultural venue and home to one of the finest organs in the world. OpenTable’s stress-free haven set to make it a Black Fri-yay!